A few weeks back I confessed that I didn't read many classics growing up, despite my mother's urging. When I hit high school, my mom did require that I begin reading some classics and she was smart to give me reading choices. She found and/or created (I'm not sure which) a list of classic books that I could choose from. One of the books that was on the list was The Prisoner of Zenda , by Anthony Hope and it was the title I selected to read. I still distinctly remember my ENJOYMENT of the book and my desire not to admit it. I remember my mom coming and asking me if I had liked it and my confessing that it hadn't been as horrid as I imagined it would have been or some such rot. She was pleased to hear I had liked it. Many times I've wondered how I would feel about the book if I had a chance to re-read it. Lately I've felt a strong urge to pick it up again and, whaddya know?, it was free to download on the Kindle. (Sigh.) So, I downloaded it and read it on our trip to bring home Bookworm4. I think it had been around 20 years since I last read it and the story had faded from my memory to some extent. (I did remember a little bit of it.) Happily, I re-enjoyed the book all over again! On the eve of the coronation of King Rudolf of Ruritania, his brother, Prince Michael, has him drugged. In a desperate attempt not to give Michael the excuse to claim the throne, Colonel Sapt and Fritz von Tarlenheim, attendants of the King, persuade his distant cousin Rudolf Rassendyll, an English visitor, to impersonate the King at the coronation. The unconscious king is abducted and imprisoned in a castle in the small town of Zenda. There are complications, plots, and counter-plots, among them the schemes of Michael's mistress, Antoinette de Mauban, and those of his dashing but villainous henchman Count Rupert of Hentzau. Rassendyll falls in love with Princess Flavia, the King's betrothed, but cannot tell her the truth. He determines to rescue the king and leads an attempt to enter the castle of Zenda. Will Raseendyll succeed or fail in his mission? I didn't include that part of the Wikipedia description so don't go peeking over there to find out. Read the book for yourself! It's imaginative, appealing to the reader's wildest dreams. It's a story of moral responsibility, duty and honor. It's a story of greed and also of sacrifice. Anthony Hope had his book published in 1894 and it has been adapted for both stage and screen many times over, most recently in 1984. This book was and has been so well received that it spawned its own genre: Ruritanian Romance. It's hard to imagine writing a book which creates a new genre of literature. That's a pretty awesome accomplishment. Hope was trained as a lawyer but enjoyed writing. He was able to get some of his short works published in periodicals but - interesting to note for many modern authors - he had to resort to self-publishing his first work, A Man of Mark (1890). A Man of Mark was similar to Zenda in that it was set in an imaginary country, but it didn't capture the public's imagination in quite the way Zenda did. He maintained his legal and a political career while continuing to write. 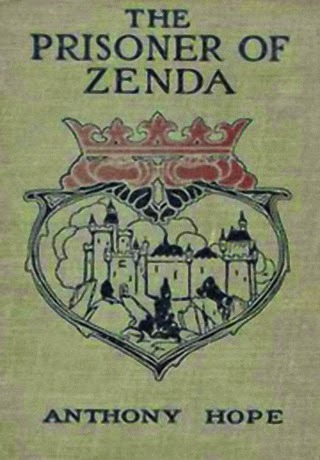 When Zenda was published in 1894, it was extremely well-received and praised by the likes of Robert Louis Stevenson, among others. This literary success caused Hope to end his legal career and focus more on his writing. In all, he wrote 32 stories and enjoyed great popularity. If you haven't read this one, I do highly recommend it. I'm so glad to have re-read it as it caused me to take a peek into Anthony Hope's life. I see there are several more stories that I could also enjoy by him and I look forward to do so over time. Thanks for the look into a classic. Loved the info on the new genre created by Zenda. And I hope one day my kids might thank me for forcing them to read ;). Oddly, I have never heard of either the book nor the author. Looks like a good one! I downloaded it already! Thanks for the tip! It sounds like a fun adventure!